To do so, they set up shop in a Bushwick basement, renting a small room below Velo bike shop on DeKalb Avenue. Recently, the bike shop packed up and left, leaving them in a momentary bind. But unlike so many New York artists, real estate was on their side this time. However, taking over the lease meant they had far more space than their small basement recording studio. They had to figure out the best way to use the storefront with which they now found themselves. But Brooklyn is a small world—through someone at Human Head record shop in East Williamsburg, they came in contact with Federico Rojas-Lavado, a vinyl seller with whom they’ll now be partnering. Now, 1345 Dekalb will trade in its spokes for grooves; Federico will open a record shop upstairs, to be called Second Hand Records, while RFB will still operate downstairs, with plans to obtain 501(c)3 status and renovate and expand their basement space into a “media workshop area,” where they will have new media classes and youth education. The two won’t be totally separate; RFB will set up a recording studio in the record store’s storefront window so they can conduct their business for the world to see (East Village Radio was an inspiration for that idea). There will also be monthly “rent parties,” where local bands will play acoustic sets in the basement while their records will be for sale upstairs. RFB hosts about 70 radio shows now, and they tell me that they’ll hit over 100 come November. 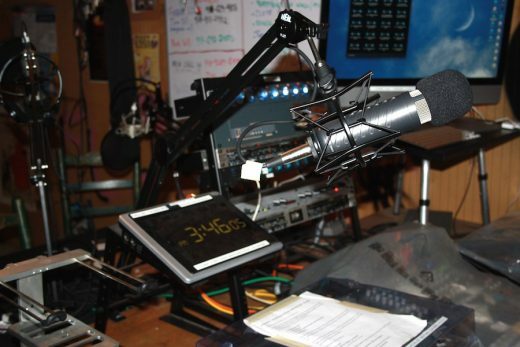 A sampling of shows includes music from Cuban to jazz to punk, a burlesque star conducting interviews, queer talk radio, and syndicated shows like Democracy Now!. Though RFB prides itself on being free-form, this influx of programming has made them look at new shows with a sharper curatorial eye, mostly out of necessity. Tenney and Prichard say this doesn’t mean they’re going to become highbrow and picky; rather, they’ll select new shows based on what the station isn’t already playing, and what flows well with their current programming. These new additions and renovations won’t come cheap. To help raise funds, they’ve been throwing a series of benefit shows throughout the city. Their latest is happening this Saturday at a DIY loft space in Bushwick. The concert will feature performances by four local bands: Dead Leaf Echo, Dru Cutler and the Heart & Hand Band, The Falling Birds, and Amos Rose. Several of these bands have been featured on RFB’s show Brooklyn Bandstand, a unique music station that only plays music by Brooklyn bands that have gigs that night, serving as a way for listeners to hear new bands but also know what’s going on in the music world around them. Though they’ve traded their performance space past for community radio and records, that legacy has certainly not been left behind. 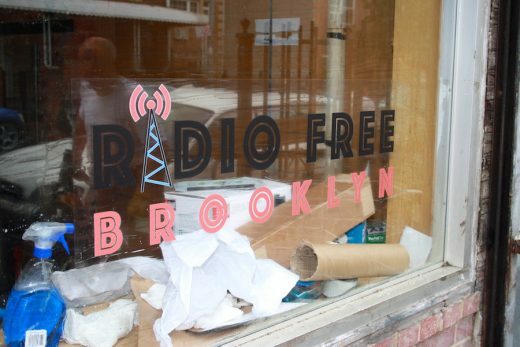 As the team traversed the rain to place a decal with Radio Free Brooklyn’s logo in the front window, a truck rolled by. There was a moment of small talk, and the drivers almost instantly recognized Prichard from his Surf Reality days, proving that the so-called glue they laid down in those days on Allen Street has indeed prevailed. 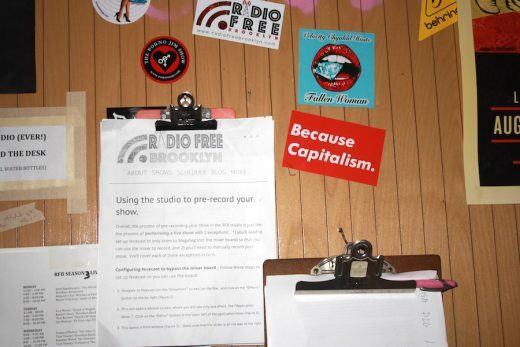 Radio Free Brooklyn‘s next benefit concert will be on September 10 at the Unit J Loft in Bushwick. Tickets are $8 in advance, $10 at the door. The soft opening of Second Hand Records is slated for September 15, with a grand opening on October 1. Update, September 6: The original version of this post was revised to correct the date of the benefit concert: it is on September 10, not September 9.